The chief priests and the scribes supposed him a threat, so they conspired to arrest him and have him killed. Judas Iscariot turned traitor and made arrangements to betray him, receiving a handsome reward for his dubious effort. Such is the backdrop of today’s gospel text; Jesus will soon be handed over and crucified. Yet, one person stands out, showing her love and devotion for her Lord. Rising above the stench of sin, the sweet fragrance of perfume danced through the air as she anointed the one who came to save her. Her devotion is unmistakable. 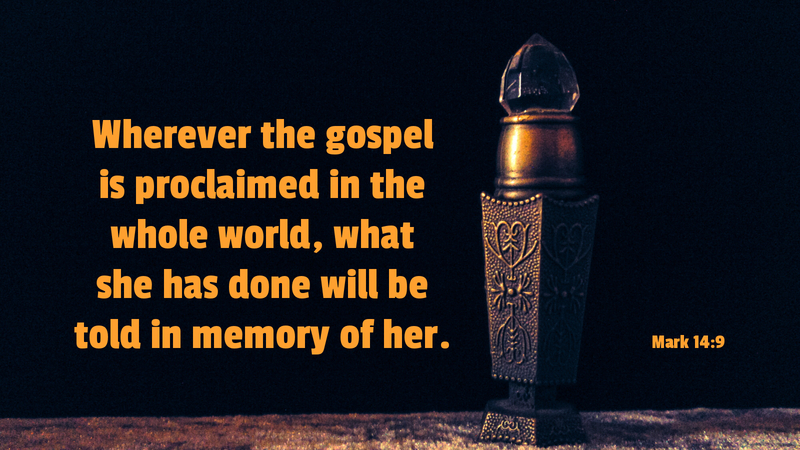 She lives, as we do, in the midst of a world refusing God’s mercy and grace. Such a world does not stop to acknowledge the Creator of all that is seen and unseen. It does not receive the one through whom salvation comes. Yet, like the woman who anoints Jesus, even today, the Church offers Christ the sweet fragrance of her worship and thanksgiving. Sing praises to the one who gives his life for you. Bow down and worship the God of your salvation. For in the midst of a fallen and sinful world, he continues to offer his mercy and grace. Prayer: May the worship we offer be pleasing in your sight, O Lord, for through you only do we have life everlasting. Amen.